Camera+ has enhanced its successful iPhone photography app with finely-tuned, exciting features and tricked-out functionality. For its version 3 release, the development team at tap tap tap & Inventive Inc have fully refined and expanded the Camera+ tools and effects arsenal to help you take, create, and share excellent photos. This is no ordinary iPhone photography app. Camera+ is a next generation iPhone photography app, that knocks Snapseed, Luminance, Hipstamatic, & Instagram back a few notches. Read along as we take the newly released update of the Camera+ app for a spin in today’s Featured app review. Camera+ incorporates all of the tools for taking one great photo or many within its highly functional camera. It has a gesture controlled zoom with excellent response. A grid helps you frame your subject. The wheel icon has the greatest feature in the camera. It has the stabilizer. If you tap the stabilizer, you will notice the difference in a normal photo and one with stabilizer. That delicate nuance has an incredible impact on the quality of your photography. The wheel icon also gives you the opportunity to add texture via the burst function or to use a timer. You can continue to snap photos with Camera+, as you do not have to finish effects, crops, and framing with each shot. 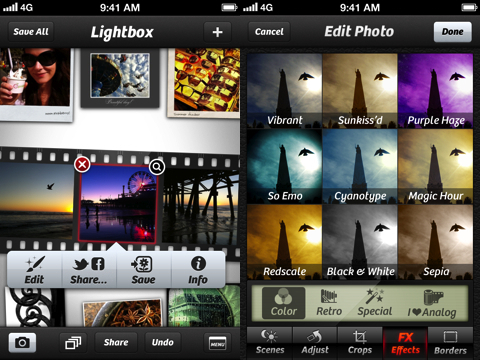 Your Camera+ lightbox is filled with your photos. I appreciate the fresh, interesting layout and design of the lightbox. It is a camera reel that zigs and zags down the screen. As you scroll down, your camera reel lengthens. With a touch, you can zoom in on your photos to finesse and share them. The photo effects offered by the Camera+ iPhone app are thorough and highly-functional. You can choose from sixteen different lighting applications. The lighting applications range from simple shade and backlit to those suitable for concert photography and text photography. You can flip your photo on its side, as well as horizontally or vertically in just one touch. The cropping tools include an opportunity for you to make your own adjustments with gestures or to choose among standard shapes and sizes. 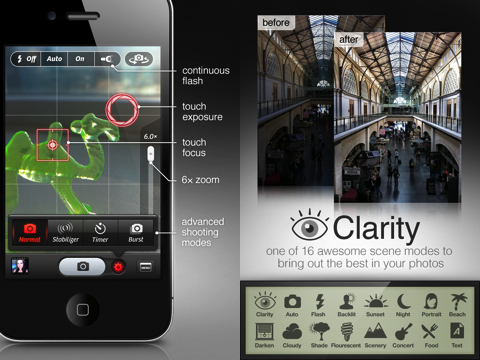 The application of photography effects has a terrific layout and interface. The effects are grouped in four different categories. Each category has nine different effects, and you get to see all as thumbnails in one screen. There is no processing, no waiting. It’s photographic instant gratification. Some of the effects require an in-app purchase, but they are great quality and worthy of the price tag. You can also adjust the intensity of the effect with easy, responsive gestures. Finally, you choose your border with a layout similar to the photo effects, but containing fewer options. The borders have a modern meets vintage aesthetic and incorporate captions as well. The captions include location services, so you can record it in one touch. This is just another time-saver continually enhancing user experience. Camera+ has elevated sharing functionality. You can select multiple photos to share at one time. With one touch, you can share one photo or many via email or SMS. You can create a web link for a photo. You can share via Facebook and Twitter, as well as add other social networking and blogging websites and resources. Once you add additional sharing options, then they will be accessed with one touch. Camera+ also has an API to ensure the growth and integration of Camera+’s photography capabilities. Camera+ is a jaw-dropping photography app for your iPhone, and it’s worth much more than 99 pennies. Enough to get Lisa Bettany as a spokesperson! Have you used it? What are your thoughts on the new Camera+ app? AppSafari review of Camera+ was written by Jenni Ward on March 15th, 2012 and categorized under App Store, Featured, Photos, Productivity, Utilities. Page viewed 10724 times, 2 so far today. Need help on using these apps? Please read the Help Page. Hi. Something is apparently changed. on? How can we get it to work again. thanks…!! Hmmm… I’m looking at their App Store description. Looks like the app now Requires iOS 4.0 or later. Have you updated to Camera+ 3 already? If so then you’ll need to upgrade your iOS software it seems.